"As for moveable furniture … don’t have too much of it; have none for mere finery’s sake, or to satisfy the claims of custom – these are flat truisms, are they not? But really it seems as if some people had never thought of them for ‘tis almost the universal custom to stuff up some rooms so that you can scarcely move in them." n a speech titled 'The Lesser Arts of Life' (1877) Morris described the 'good citizen's' furniture as 'solid, and well made in workmanship', in which the design had ‘nothing about it that is not easily defensible, no monstrosities or extravagances’. This is certainly the case with Morris’s Sussex range of furniture, shown here in the exhibition. The sturdiness, elegance and simplicity of design found in this range reflects Morris’s loathing of the clutter and overly designed furniture found in many Victorian homes of the period and his desire for more restrained domestic environments. 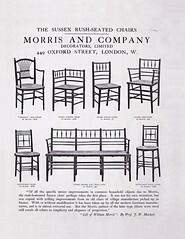 Inexpensive lightweight chairs such as in the Sussex range were produced and sold by Morris & Co. from 1865 until the early twentieth century. Their design was drawn from historic English chairs. Based on a Regency prototype, possibly designed by Philip Webb around 1860, they were very popular and made in vast quantities until the 1910s. The elegant spindly frames are an excellent contrast to rich colourful furnishings. The Rossetti armchair, based on French country chairs of the early nineteenth century, was named after Dante Gabriel Rossetti, although there is no evidence that Rossetti designed it.